In Proceedings of Pervasive '11, the Ninth International Conference on Pervasive Computing, San Francisco, USA, June 12-15, 2011. Springer Lecture Notes in Computer Science, 8 pages. 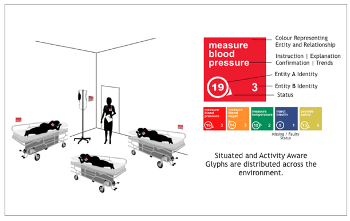 ffers a reflection on the design space for a situated glyph - a single, adaptive and multivariate graphical unit that provides in-situ task information in demanding work environments. Rather than presenting a concrete solution, our objective is to map out the broad design space to foster further exploration. The analysis of this design space in the context of dynamic work environments covers i) information affinity - the type of information can be presented with situated glyphs, ii) representation density - the medium and fidelity of information presentation, iii) spatial distribution - distribution granularity and placement alternatives for situated glyphs, and finally iv) temporal distribution - the timing of information provision through glyphs. Our analysis have uncovered points to unexplored problem space, which may motivate further work in the field. Jo Vermeulen, Fahim Kawsar, Adalberto Simeone, Gerd Kortuem, Kris Luyten and Karin Coninx.